Demand for commercial real estate loans, despite record levels of liquidity, has softened in recent months, leaving eager lenders chasing fewer borrowers. As a result, competition among lenders has ratcheted up noticeably with loan prices compressing. Deal pricing and structures in the U.S. commercial real estate market – including Philly 1031 exchange transaction properties – has gotten so competitive that many of the nation’s banks, including its 25 largest cumulatively, are starting to back off from commercial real estate lending. 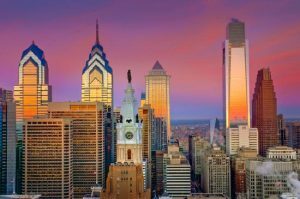 This report on U.S. and Philadelphia commercial properties is being made through Philadelphia commercial real estate broker Wolf Commercial Real Estate, a Philadelphia commercial real estate brokerage firm. Federal Reserve data earlier this year first revealed the trends among banks, which held up through the entire quarter. Now in the past week, bank executives in the national and Philadelphia commercial real estate market have started providing color and analysis to the data in their first quarter earnings conference calls. First the numbers. The total amount of commercial real estate loans on bank books related to national and Philadelphia commercial real estate properties increased $26.4 billion to $2.1 trillion through the first quarter from year-end, according to Federal Reserve data. However, real estate loan exposure concerning U.S. and Philadelphia commercial real estate listings pulled back at the nation’s 25 largest banks, dropping off about 1 percent on an annualized basis. Those 25 banks account for 33 percent of commercial real estate bank loans outstanding. Meanwhile, the rest of the nation’s domestic banks doing business in the U.S. commercial real estate market – including Philly 1031 exchange transaction properties – continued to grow their loan portfolios by 7 percent on annualized basis. The appreciation that has occurred in property values has contributed to a lower level of inventory available in the market. Deal volume is also down as investors are taking a more cautious stance in the current environment. Some banks report a majority of their first quarter commercial real estate loan production consisted of refinancing; with interest rates beginning to climb, some bankers expect refinancing volume could slow down. For more information Philadelphia commercial properties, please call 215-799-6900 to speak with Jason Wolf (jason.wolf@wolfcre.com) at Wolf Commercial Real Estate, a leading Philadelphia commercial real estate broker that specializes in Philly 1031 exchange transaction properties. Wolf Commercial Real Estate, a Philadelphia commercial real estate broker with expertise in Philadelphia commercial real estate listings, provides unparalleled expertise in matching companies and individuals seeking new Philly 1031 exchange transaction properties with the Philadelphia commercial properties that best meets their needs. As experts in Philadelphia commercial real estate listings and services, the team at our Philadelphia commercial real estate brokerage firm provides ongoing detailed information about Philadelphia commercial properties to our clients and prospects to help them achieve their real estate goals. If you are looking for Philly 1031 exchange transaction properties for sale or lease, Wolf Commercial Real Estate is the Philadelphia commercial real estate broker you need — a strategic partner who is fully invested in your long-term growth and success.